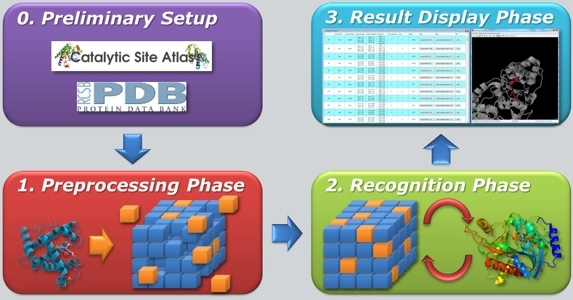 Ab initio molecular modeling techniques have been used for in silico structural genomics initiatives for the prediction of the structure and function of proteins from pathogenic bacteria. This initiative has led to obtain structural and functional information on about 70 Streptococcus mutans proteins (Bizai et al., manuscript in preparation) and 90 Pseudomonas aeruginosa proteins (Caprari et al., manuscript in preparation), some of which could be used as molecular targets for the development of new antibacterial drugs. 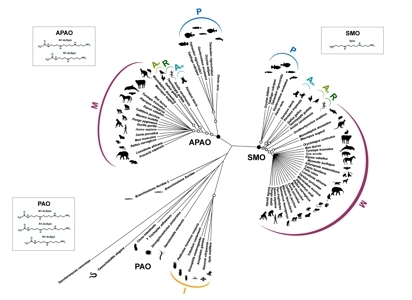 The catalytic mechanism and substrate specificity of the vertebrate polyamine oxidases spermine oxidase (SMO) and acetilpoliammino oxidase (APAO) are studied using molecular modeling techniques, rational design of site-specific mutants and molecular docking simulations combined with experimental studies. 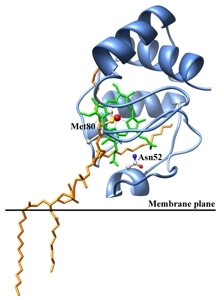 These studies have allowed us to identify residues involved in the binding of the substrates to SMO and APAO (Tavladoraki et al., 2011; Cervelli et al., 2012) and to clarify the molecular bases of the different substrate specificity of these two enzymes (Polticelli et al., 2012; Cervelli et al., 2013). 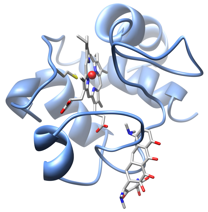 It has been also possible to understand the role of specific residues in the catalytic mechanism of this family of enzymes, through the design of site-specific mutants and the structural characterization of these mutants by X-ray diffraction (Tavladoraki et al., 2011; Fiorillo et al., 2011). Modeling studies and molecular docking on the complex Cyt c- cardiolipin allowed to hypothesize the possible binding mode of the lipid to Cyt c. The formation of this complex leads to the conversion of Cyt c from a protein active in electron transfer to an enzyme with peroxidase activity involved in the early events of the apoptotic process (Ascenzi et al., 2011; Patriarca et al., 2012). Furthermore the role of effectors, such as ATP and sodium chloride, and of the basic residues of the protein in the modulation of the interaction Cyt c-cardiolipin has been investigated (Sinibaldi et al., 2011; Patriarca et al., 2013). 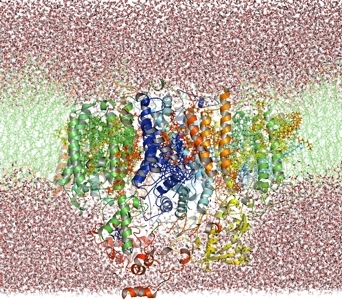 The relationship between structure and function of the photosystem II macromolecular complex was studied by means of molecular dynamics and docking simulations, in order to clarify the structural and energetic basis of the binding of endogenous (quinones) and exogenous (xenobiotics such as herbicides) ligands (Rea et al., 2011b; Zobnina et al., manuscript in preparation). This study has allowed us to develop site-directed mutagenesis strategies to increase the affinity of photosystem II for xenobiotics. These strategies have been validated experimentally with success in the case of the herbicide atrazine (Zobnina et al., manuscript in preparation ) and form the basis for the development of biosensors for xenobiotics based on photosystem II. The structural basis of the sensitivity of photosystem II to oxidative damage were also clarified (Rea et al., 2011a), a prerequisite for rational engineering of photosystem II in order to increase its stability. This is essential for the use of photosystem II in biosensors. 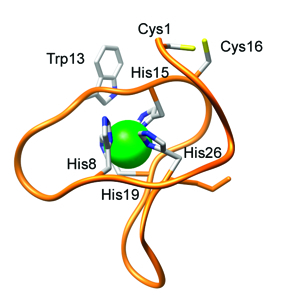 From this viewpoint, the research was addressed also to the rational design and characterization of peptides able to mimic the photosystem II binding pocket. The result of this research was the development of a soluble peptide able to properly fold in the presence of the ligand and bind the herbicide atrazine with nanomolar affinity (Scognamiglio et al., 2013). 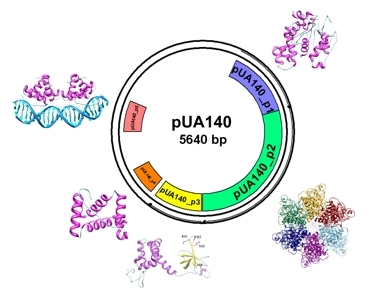 Miniproteins, peptides of varying length from 10 to 40 amino acids characterized by a well defined structure, represent interesting alternatives to larger macromolecules for applications in biosensor development or industrial catalysis. In this framework, a series of miniproteins have been designed and experimentally characterized which are able to bind selectively and with high affinity transition metals, and catalyze redox reactions such as the dismutation of superoxide radicals (Barba et al., 2012). A system for the expression in recombinant form and the isolation of miniproteins has also been developed, useful for large-scale production of metallopeptides with redox activity (Spiezia et al., 2013).